To many people in the Asian countries, the betel leaf and the arecanut, popularly known as tambula, is symbolic of a civilized lifestyle. Its very mention brings to mind myriad beautiful images. Narayana, in his 12th century AD treatise, the Hitopadesa (Book of Good Counsels), has said that "the betel nut is bitter, hot, sweet, spicy, binding, alkaline - a demulcent, an astringent, a foe to the evils of the intestine; giving to the chewers a fragrance of breath, to the lips a crimson red; a kindler of loves flame ... Praise to the Gods for the good betel! These be the thirteen virtues given, hard to meet in one thing blended, even in their happy heaven." Sushruta, the patriarch of Indian surgery (2nd century AD), has expressed similar views on the virtues of tambula. Abdul Razzak, a Persian traveller in the Kingdom of Vijayanagara (1443) has described it in these words: "This masricator lightens up the countenance... 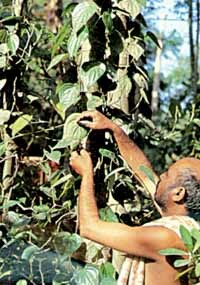 It relieves hunger, stimulates the organs of digestion, disinfects the breath and strengthens the teeth..."
Piper betel, paan to millions of Indians in the north, is a very satisfactory after-dinner chew. Extensive research has established that the betel-chewing habit is 8,000 years old and is not restricted to India alone. Despite the frenetic pace of modern times, tambula, the worlds oldest chew has not been totally forgotten. Today, the ritual of the green leaf is an integral part of the Indian lifestyle. Incidentally, India exports large quantities of arecanuts to Nepal and the Middle East. In addition to promoting smooth social relationships, offering tambula is considered a sign of good culture and a cultivated accomplishment among women. In the Hindu ethos, tambula is accepted as one of the bhogas (cardinal pleasures) of graceful living. No religious ceremony or worship is complete without tambula, along with coconuts and flowers. During the Mughal era, tambula acquired enormous importance. They saw to it that everything associated with the green leaf and the nut was extremely elegant. Accepting tambula from the king implied a pledge of loyalty and friendship. In addition to the green leaf and the nut, betel boxes have also figured prominently in traditional Asian weddings and also in the day-to-day-life. Myanmar is famous for its beautifully crafted and lacquered betel boxes. Not many people know that a young Burmese girl is called sireh, which means tender leaf. India accounts for vast plantations of betel leaves of different types. In the north of the country, the Desi, Calcutti and the Banarasi leaves are most favoured. Prominent among the leaves from the southern states are the small and fragile chiguruyale of Karnataka and the thicker and more popular ambadi and the kariyale. Many charming accessories have evolved around the tambula and a variety of beautifully crafted betel boxes, nut-crackers, plates and lime containers, in addition to betel pounding contraptions, have become an integral part of many homes. Each state in India revels in making its own special boxes, mostly from brass, though silver boxes are not uncommon in some northern states - a legacy of Islamic finesse. These boxes and nutcrackers have a variety of animal, bird and human motifs and are now treasured by private collectors and museums. Together they bear witness to a charming tradition.